On this 788 tour, we traveled to John Creek Farms and spent the afternoon with an amazing team of cannabis advocates and cultivators. SQ788’s passage has to-date, produced over 2,100 licensed cannabis growers in Oklahoma. 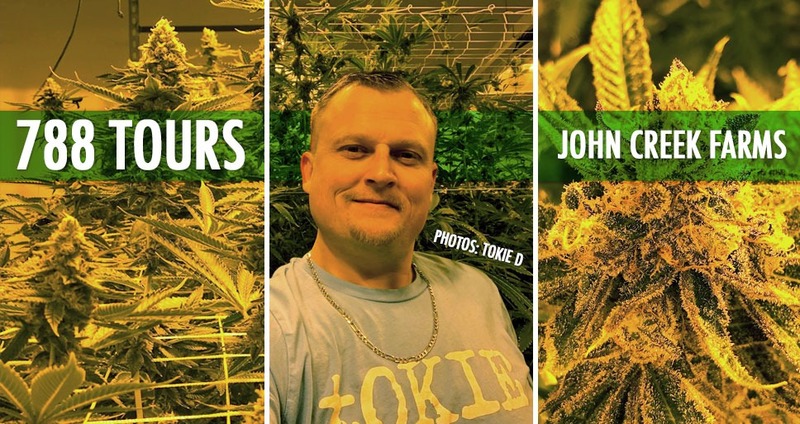 John Creek Farms aims to stand apart with old and new growing techniques by a group of cultivators passionate about cultivating quality medicine for patients. We were first shown the mother plants and vegetation area. These are plants that are used for cloning and were being tended to with extra care and oversight by multiple people and in a clean climate controlled environment. Next, we were taken to see the plants in different stages of flowering. This was impressive as the cultivators were using multiple growing techniques (Sea of Green and Super Cropping) in the same room. John Creek Farms had a large cultivar selection that we were told was carefully selected for a wide range of effects and purposes. Special blends of nutrients and careful feeding schedules were being logged while different genres of music filled the room, keeping the cannabis happy. In addition to the farm downstairs, John Creek Farms is true “Farm-to-Patient” with a full production facility and commercial kitchen producing edibles, capsules, and oils under the Creekside Extracts brand of products. The patient-focused aspect that we enjoyed were the micro-dose options of edibles and oils. It was also a first to see infused peanut butter and jam. Big shout out to Tokie D from Tokie Tees for joining and taking some awesome pics!